In 1431 France, Jeanne d’Arc is burned at the stake. In the present as Ruler, she wonders why she has been summoned for this strange Holy Grail war as she makes her way to the site of the conflict. Meanwhile, the effeminate Black Rider introduces himself as Astrolfo of the Charlemagne Paladins. He wants to know the identity of the other Black Servants. He goes to Black Archer, who receives permission to reveal himself as Chiron. Black Berserker refuses to give her name. Her Master reveals Black Berserker to be Frankenstein’s monster to her chagrin. When Black Rider tries to learn Black Saber’s identity, his Master forbids it and he’s backed by Darnic. Black Lancer identifies himself as Vlad Tepes, stating that the war they are fighting is for Romania. 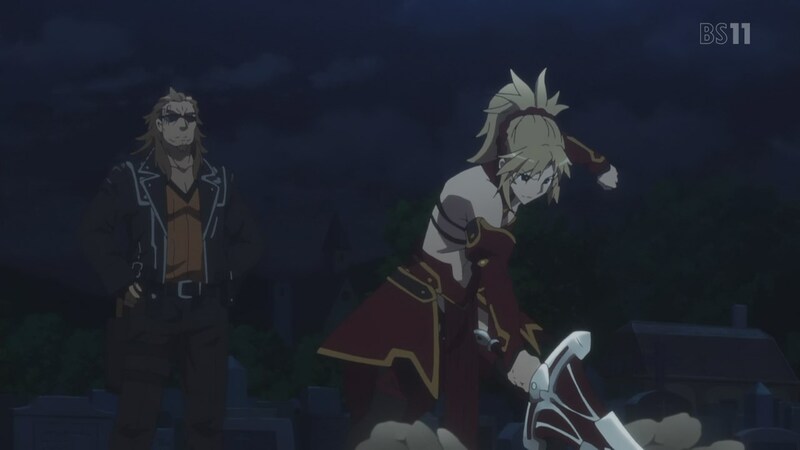 Back at the graveyard, Sisigou introduces himself to Red Saber, stating his surprise that Mordred is a woman. 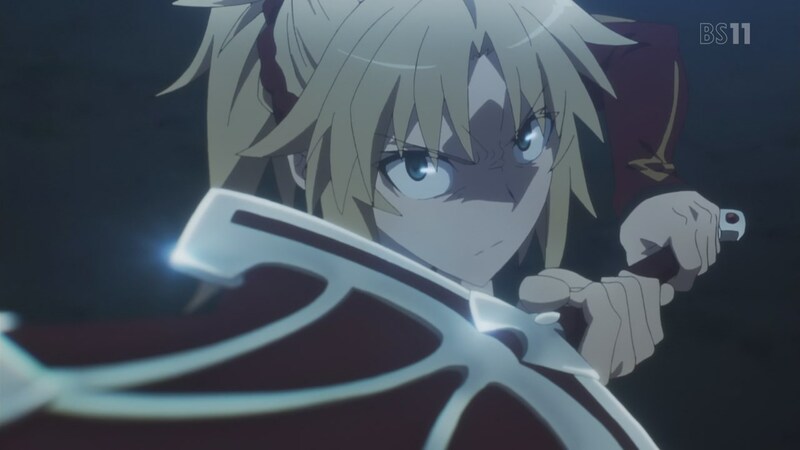 This angers Red Saber, who doesn’t like being called a woman. Red Saber destroys the relic that summoned her and says her wish is to try to pull Excalibur as her father did. She’s not amused to learn they are heading to visit the Church representative. Meanwhile, Caules apologizes to his Servant Black Berserker and has her test her Noble Phantasm on large golems. Fiore has a chat with her Servant, Black Archer, expressing her surprise that Chiron didn’t summon as a centaur. In a dungeon, is sexually licking her Servant, Black Rider, who grows weary of this and leaves. Elsewhere, Gordes summons Black Saber, demanding to know what Siegfried wants from the Holy Grail. When Black Saber doesn’t have a wish, Gordes is not happy. Still elsewhere, Darnic attends to Black Saber, where the two chat about Vlad’s wish. They discuss that they have only one more Servant to come, who’s to be from the Assassin-class. Darnic says that this Servant is to be Jack the Ripper, a female. 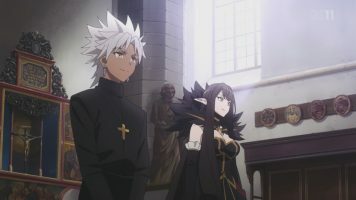 A priest name Shirou Kotomine greets Sisigou and reveals his Assassin-class Servant Semiramis. Red Saber reveals herself in full armor, sensing trouble. Red Assassin is unable to gain the true identity of Red Saber as Sisigou announces he and Red Saber will be going solo. Shirou speaks of the summoning of Ruler for this Holy Grail war. 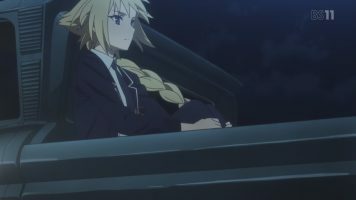 A satisfied Red Saber and Sisigou head to enemy territory, where Sisigou buys her civilian clothing. 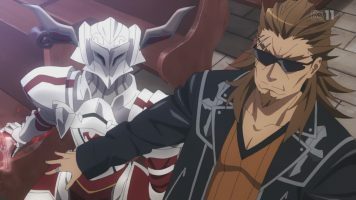 Red Caster (Shakespeare) reports to Shirou that Red Berserker (Spartacus) has gone off on his own as well. Meanwhile, the Yggdmillennia dispatch a force to attack Sisigou and Red Saber, but the force is easily defeated. Shirou orders another Red Servant to attack Ruler as she heads to Trifas. And so here we are with Fate/Apocrypha 02. 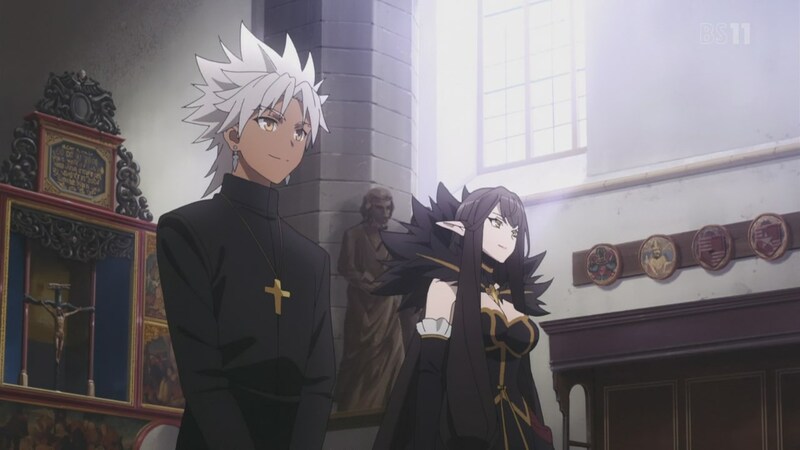 And thanks to Fate/Grand Order, my greatest source of interest is seeing Servants I’ve encountered or even summoned from the game appear in this anime. But there is some interest in the intrigue going on within the Red and Black camps. More Famous Men as Women Plus a Trap! I didn’t talk about it a great deal in my review of episode 1, but with episode 2, we see more of Red Saber’s thoughts of being the “son” of Arthur Pendragon. Sisigou didn’t know Mordred was in fact a woman, and based on his discussion with Red Saber, it seems unlikely that he knows that Arthur was actually Artoria (or as stated “officially” in Fate/Grand Order, Altria), who is also female. Then there’s Frankenstein’s monster as Black Berserker. I’ve kept from spoiling myself, but it seems that Dr. Frankenstein created a female creation, not a male one. How she’s summoned as a Heroic Spirit is a story I’d love to know. 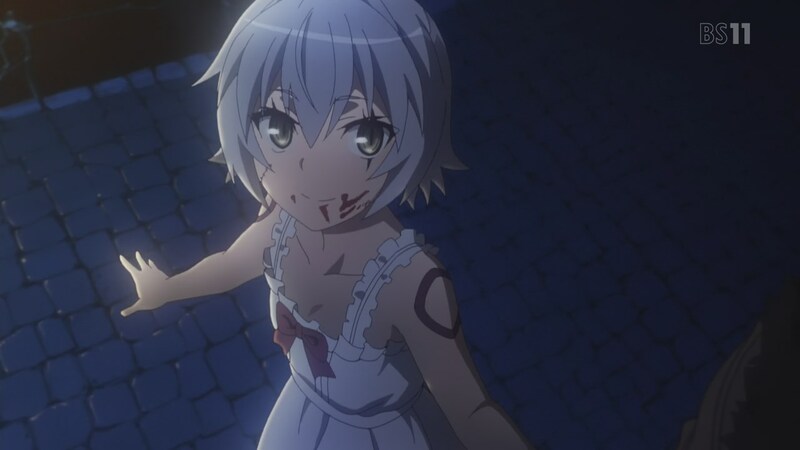 Well, as a Berserker, she’s pretty cute. And for a Berserker, she’s got an interesting personality by being offended by things and going into a huff. I had a feeling in the first episode that while the Black Faction was set up to be evil and the Red Faction as good, things are a great deal more nuanced than that. Within the Black Faction, a number of the Masters don’t come off as evil, nor do their Servants. I’d say three come off as kinda normal and the other three less so with Celenike being pretty insane. Their leader is Vlad III, better known as Count Dracula. But since he hasn’t been summoned as Berserker (as in Fate/Grand Order), he’s not a vampire here. So this put an interesting twist on the character. 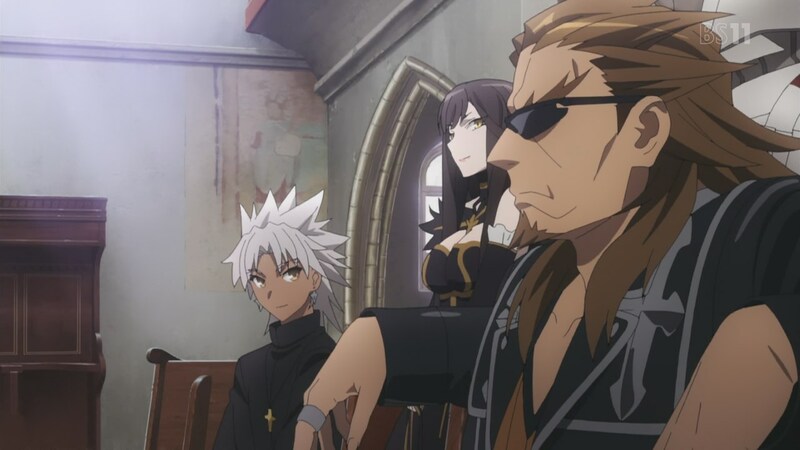 On the Red Faction side, the priest Shirou seems to have an evil agenda. For some reason, he wants Ruler killed. (More on her in a bit.) And he seems to be trying to take control of the Red Faction. Sisigou is a necromancer, whom tradition usually has in the evil category. Yet here, he seems to be chaotic good in alignment. Go figure. I find myself liking Red Saber as a character. 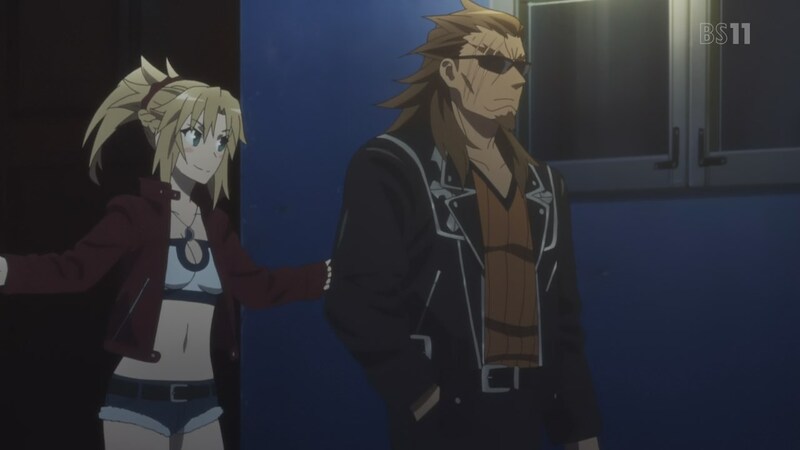 Mordred makes a cute girl, but as a supernatural Servant, she’s pretty wicked. (And though she’s not in the U.S. version of Fate/Grand Order yet, she’s in the Japanese game and is a 5* Saber Servant, making her pretty powerful.) I like how she’s cautious yet aggressive. In many ways, she’s the opposite of Saber Artoria from Fate/stay night. In fact, she follows a yankee trope type of Japanese female characters. And she can vanish like other Servants, something Saber Artoria could not do. 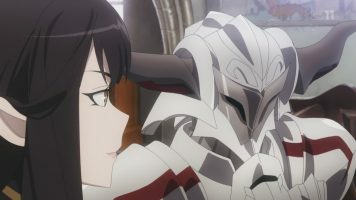 I did find it interesting that she sensed trouble from Red Assassin and made sure to hide her true identity from her Servant teammate. 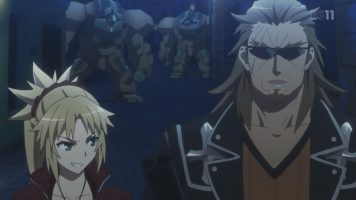 This intrigue element within the Red Faction is the one piece of the Fate/Apocrypha series that has me interested at a story level. I totally missed this on my first viewing of Fate/Apocrypha 02, but Ruler (Jeanne d’Arc) seems to have the same limitations on her as Saber Artoria did in Fate/stay night. She doesn’t “vanish” or insta-travel from point to point. Instead, she has to take whatever cheap transportation is available to her, including apparently hitching a ride. She seems to have already been summoned, based on that little scene at the end of episode 1. If that’s the case, I’m not sure why she’d still be on Earth. When was she last summoned? Ruler is supposed to be a neutral character in the war (though we know from episode 1, she does get involved in the fighting), though her alignment is Lawful Good. I have her as one of my three 5* Servants in Fate/Grand Order. 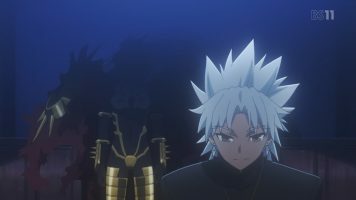 Time to wrap up the review of Fate/Apocrypha 02 so I can get to the next episode. Red Berserker running wild made me laugh, mainly because as a summoned Servant in Fate/Grand Order, he’s a 1* worthless Berserker. I’m guessing they’ll make him a bit more viable for this anime, but I don’t expect him to be around long. 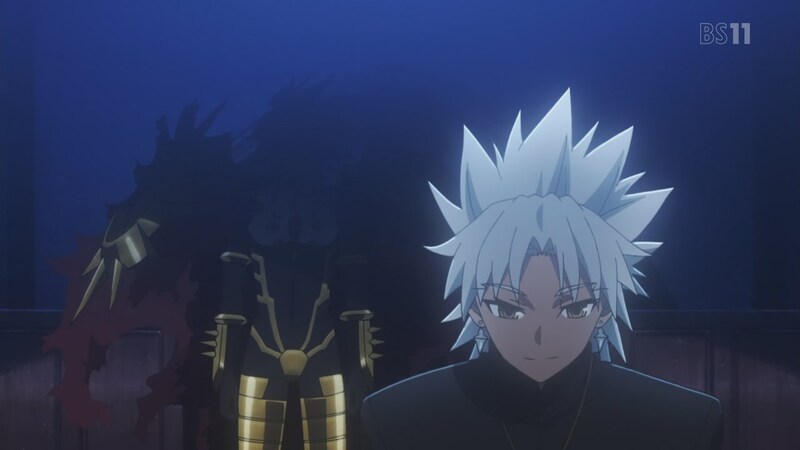 I wish I knew whom the Red Servant was at the end of this episode. I could have looked up the name, but I decided not to. Sisigou uses the Gandr magic via a sawed-off double barrel shotgun? I laughed when he produced it ’cause I thought about the classic Doom II game. Also, did Sisigou use a heart as a grenade? That was so weird, but I guess that’s part of his necromancer powers. 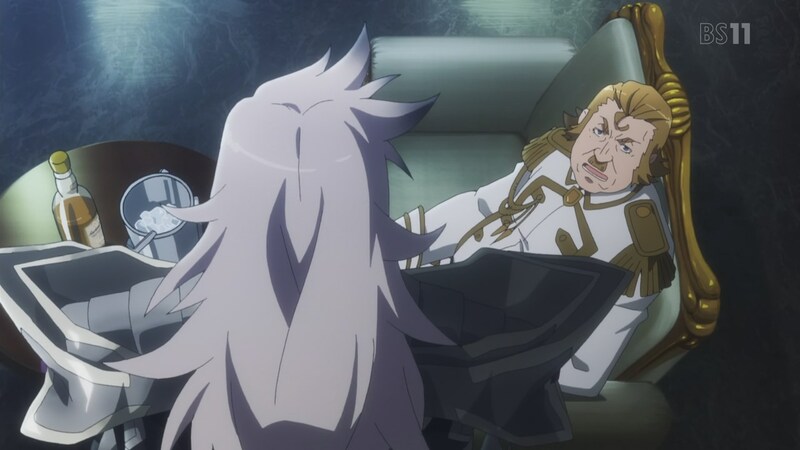 In the end, Fate/Apocrypha 02 continues to set the table and establish initial moves for characters. The biggest appeal to me still continues to be from seeing Servants in the Fate/Grand Order game appearing in this anime. However, I also have some interest in the idea that the evil Black Faction may not be totally evil and the good Red Faction may not be totally good. Nothing to say really that I didn’t already mention in my comment on episode 01. Still not terribly impressed. Vlad’s hair color is just incredibly stupid. What was the LN illustrator thinking? Not sure. 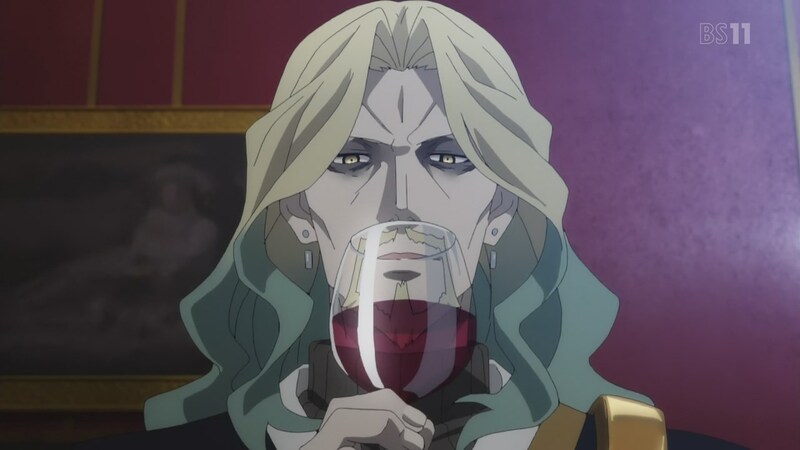 Vlad’s appearance in Fate/Grand Order is all I know. Considering the MASSIVE liberties the Fate franchise takes with historical characters, I guess “Dracula” looking this way didn’t bother me (even though he’s not a vampire in this story). Interesting fact: there’s multiple Jack the Rippers in the Nasuverse. And I don’t mean “alternate versions”, completely different beings. Which one is the “true” one is something even they don’t know, if there even was a “true” one. Interesting. I did not know that. Where all does Jack show up? I know the character will be in the US version of Fate/Grand Order and obviously the little girl version is in Fate/Apocrypha. 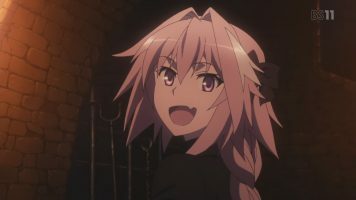 As far as I know, while there are multiple Jack the Rippers in that universe, only Little Girl and another Jack, a Berserker who appears in the Fate/Strange Fake novels, have been summoned in one continuity or another. 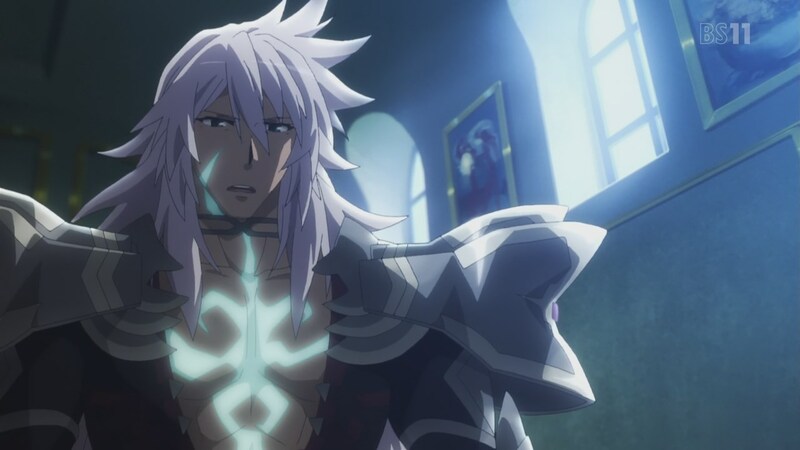 Berserker Jack is a very versatile shapeshifter, by the way, even taking Apocrypha Jack’s figure at one point. As for Little Girl Jack herself, no, she wasn’t a prostitute, although she does have a strong link to prostitutes of that era. 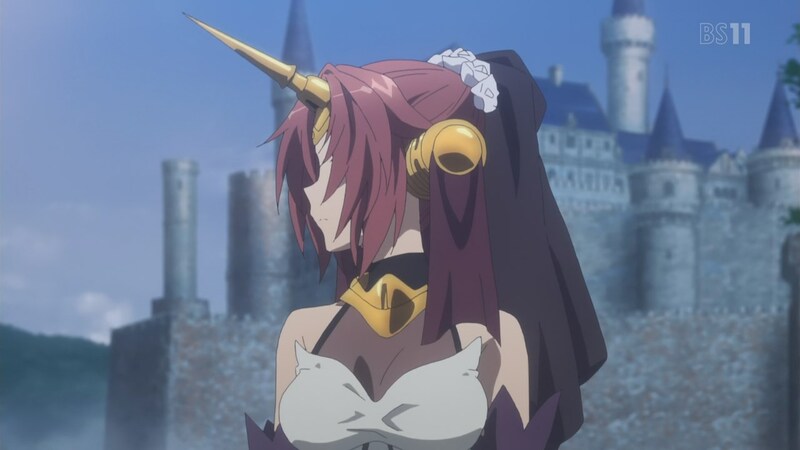 …she’s inhabiting an actual human body, that of a modern day descendant of Jeanne D’Arc’s original family. We’ll see more of that later in Grand Order, where other Heroic Spirits take on the bodies of familiar characters from the Fate franchise like Rin and Taiga. Um… when the hell was it stated that she posses Laeticia because they were family? 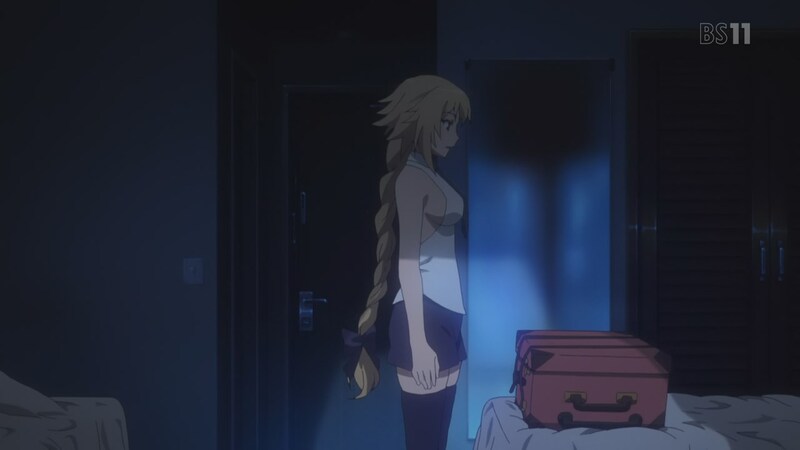 The actual material and novel states that Jeanne possesses her because they were compatible with each other in both physical and spiritual attributes. And it’s technically not really a spoiler when Episode 1 shows us the possession in the first place. Always watch the after credits scene if there is one. I watched that, but I didn’t see a possession. As I saw it, Jeanne was still on Earth for some reason and was being summoned to the latest Holy Grail War. In fact, I didn’t know Heroic Spirits possessed humans. Its a voluntary possesion since Jeanne asked Laeticia to be her host and she willingly acepted, resulting on both of their personalities being a bit mixed. Shouldn’t Jeanne be able to read anyway, even if she couldn’t when she lived? Servants are imbued with all sorts of practical knowledge needed to live in modern times even if they didn’t have it originally, after all. They are imbued with knowledge, not skills, a servant can know what a car is but cant drive it unless he/she has an special skill to do so (riding skill on this case) or bother to learn to drive from scratch. Iskander was an Ilyad nerd when he was alive so you can deduce that servants get things like language for free, but only variations of skills such as reading(japanese version) if they could read originally. 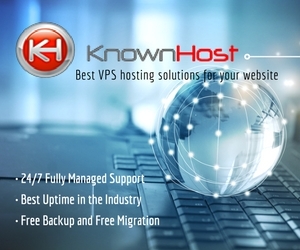 For example, a servant can have issues handling a pc the same way a normal person can if he/she wasnt technologically adept on the first place. That doesnt mean that he doesnt knows what a pc is. Using Iskander once again we know that on life he always loved to try new things and was very open minded, and thats the reason he adapts so well buying airplanes/tanks/etc diorames and videogames. On the other side we have Rin that has no clue on how to use a blue ray recorder.